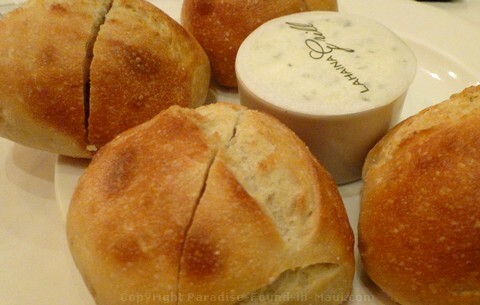 Lahaina Grill: Could This Be the Best Lahaina Restaurant? 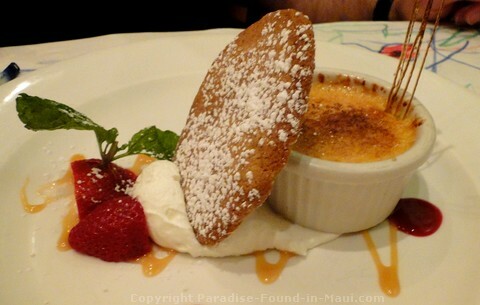 The Lahaina Grill is undoubtedly one of the best restaurants in Lahaina. Actually, it's probably safe to say this high-end Lahaina restaurant is one of the best on the entire island of Maui. Out of all the restaurants in Maui, this one was high on my wish-list for a splurge-night dinner. 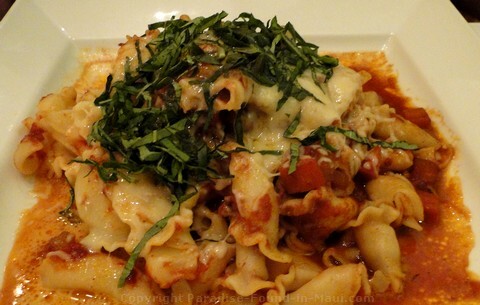 Their menu of new American Cuisine incorporating fresh, local ingredients is hard to resist. So How Was Our Splurge Night Dinner? Our splurge night dinner at this fine Lahaina restaurant was unbelievably good and rather fantastic! We enjoyed exceptional food, and very attentive service. 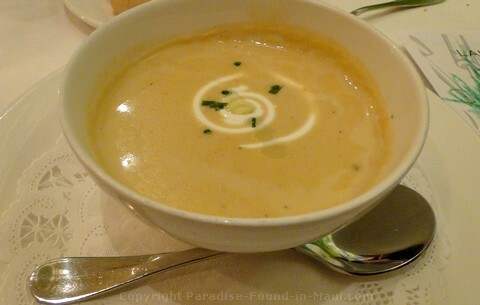 I started with the Sweet Kula Corn Soup, which is garnished with truffle oil and creme fraiche. My husband, Paul, tried their Baby Spinach Salad. 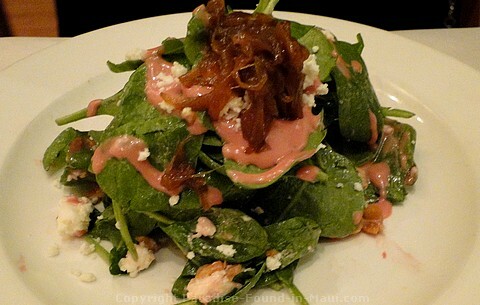 But since it's the Lahaina Grill, this was no boring run-of-the-mill spinach salad. It was way more interesting than any other I've seen with it's toasted spiced marcona almonds, caramelized maui onions, plus feta cheese and a raspberry vinaigrette. Delicious! Then came the entrees. An Angus New York Steak with a mild mushroom-balsamic demi-glace and herbed potato gratin for me. For Paul, it was Chef Arnie's Homemade Meatballs made from a delicious combination of all natural veal, pork and angus beef - all served over ballerine pasta with their olowalu tomato-basil sauce. Mmmm, mmmm, mmmm. We were getting pretty full by then, but especially since we were at what is not only one of the best restaurants in Lahaina, but one of the best restaurants in Maui, we just HAD to try dessert. I couldn't resist the Kauai Pie. 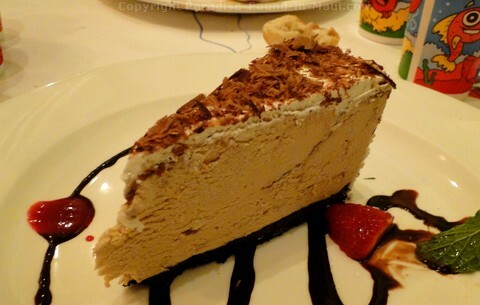 The delicious slice of this oreo-crusted kona ice cream pie was perfection on a dessert plate for sure! There was yummy chocolate fudge, coconut flakes and macadamia nuts throughout. Paul enjoyed the creme brulee! How Much Will a Dinner Here Cost Me? Entrees range in price from about $30 to just under $50. So it's possible for a couple to dine here for as little as $60 (plus taxes and tip) if you forgo drinks, appetizers and dessert. Honestly, the food here was so incredibly good, if the only way you can afford to come here is by doing that, then I totally think you ought to give it a try - it will be totally worth it to dine at one of the best restaurants in Maui! And of course, if you're able to go all out, the sky's the limit on what you could spend here between the entrees, appetizers, salads, dessert, and wine. The price-range for entrees was based on early 2012 pricing. 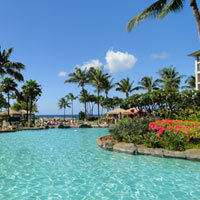 As with all restaurants in Lahaina and restaurants in Maui as a whole, prices may change at any time. Will I Need Reservations at This Lahaina Restaurant? 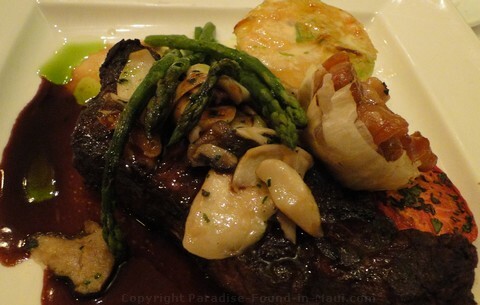 As you would expect at one of the best restaurants in Lahaina, reservations are highly recommended. You can make your reservations by contacting the Lahaina Grill at (808) 667-5117. Our kids were preschool aged when we brought them here with us, and although they were the only children in the Lahaina Grill that night, they were made to feel more than welcome. Like most of the restaurants in Maui, there was a keiki (children's) menu, plus crayons and stuff for the kids to colour. If your kids want to, they can even submit a drawing for their monthly best drawing contest. How Do You Get to the Lahaina Grill? This Lahaina restaurant is located on the main floor of the the historic Lahaina Inn at 127 Lahainaluna Road. They're open for dinner 7 days a week starting at 6 p.m.
To get to this fine Lahaina restaurant, just follow the Honoapiilani Highway into Lahaina town. 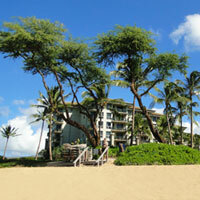 At Lahainaluna Road, make a turn towards the ocean. The easiest place to park is in the parking lot across from Gerrard's Restaurant in the Plantation Inn. You'll see Gerrard's on your right, and the parking lot on your left. From here, it's a very short walk to the Lahaina Grill main entrance, which is also on Lahainaluna Road, just a short distance from Front Street. If you're walking here along Front Street, you'll see Cheeseburger in Paradise on the ocean side of Front Street, and Lahainaluna Road intersecting with Front Street right there too. 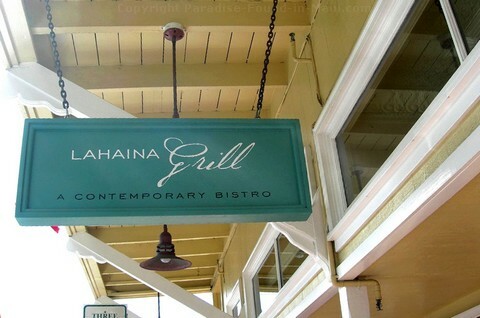 Walk onto Lahainaluna and you'll see the main entrance for the Lahaina Grill on your left. 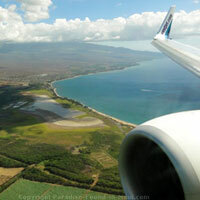 1) Lahaina Maui: Things to See and Do, Where to Dine and More!